The Ship Inn Hotel is situated at the center of Kyrenia surrounded by a greenish olive and citrus groves and vineyards. As it is in the center of the city the taxi service and local bus service are easy to access. This resort includes 73 twin and double- bedded hotel rooms and 6 two-bedded villas with all facilities like air conditioning, heating, satellite TV, telephone lines connected separately, internet with broadband connection, kettle, fridge, bathroom with shower, and a private balcony. From the balcony it is evident that everyone can have a beautiful view of mountains and sea. For dinning there are restaurants which serves them food of different varieties with special chef's guarantees for taste. This hotel is rated as one of the best hotels around that region. 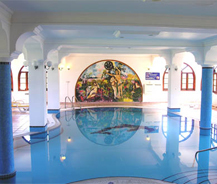 This also offers various recreation facilities such as outdoor pool with special section for children's. The hotel has a newly opened indoor pool with Jacuzzi and fitness room. Sauna, massage and beauty care is also available in this hotel but at extra cost. Other than these the hotel offers the guests a great customer service and helps all in each and every aspect in case of any problem. All people like to spend more time here because of their service and quality hence if you are interested in taking a holiday trip then make your presence here and enjoy all the privileges.